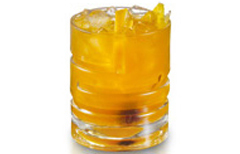 In an ice-filled shaker, add 2 oz bourbon, 2 oz Master of Mixes Mango Daiquiri/Margarita Mix and 2 oz Master of Mixes Sweet & Sour mix. Shake hard and strain into an ice-filled glass. Garnish with fresh mango and serve.